Doug Gardner brought up some very intresting questions and statemens. Thank you for that. Now looking at some replies at that, I can't help me wondering by the reply of Arne Focke. Clearly you have a good sight in the subject. But how can it be that the outcome of the Marcomannic war had any direct effect on warfare of the southern scandinavian tribes. Issn't that just generalizing? 'The cruels and threachery of civilization, that is barbaric! ', said the free Frisian to his son..
Of course it is somewhat generalized to say it like that. This subject alone takes up two meters of my personal library, so I just tried to keep it simple. But there was a huge influence between the germanic tribes on both sides of the Baltic sea and not always a friendly one (as shown by the bog finds). Of course there are differences as well as similarities, but the weapons tend to be more similar than different. In the discussion of the Illerup Army origins a strontium isotope study from 2 of the 4 horses found slaughtered has been conducted. It was older horses (6/7 - 10 years old) - so likely trained warhorses according to the article. These are likely all 4 from the sacrifice A; the major one ~210 AD. Dobat et al (2014): The four horses of an Iron Age apocalypse. Great article I really recommend reading!! "With the 87Sr/86Sr values below the baseline of strontium isotope values in both western Norway and western or central Sweden, it is unlikely that the horses came from either of those regions. They could, however, have come from the Viken area in southern Norway". "On the other hand, there is a good match between the two Illerup horses and the 87Sr/86Sr baseline for southern Scandinavia. 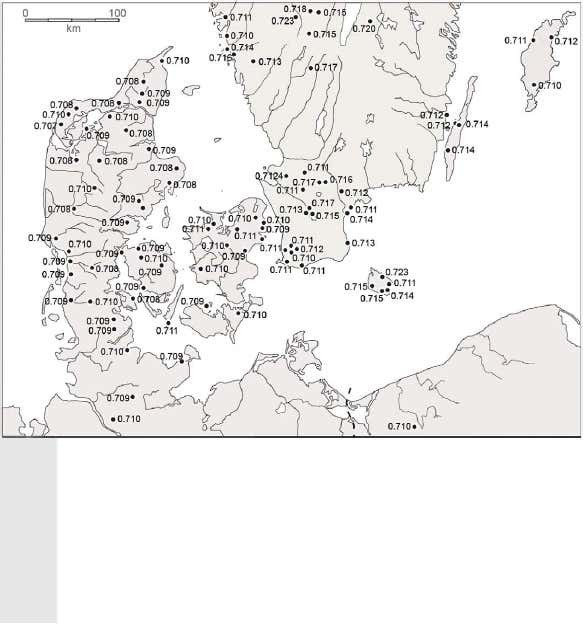 Values around 0.710 are commonly found in various places in Jutland, Zealand and Scania, suggesting that the horses might well have been born and raised somewhere in the moraine landscapes of modern-day Denmark." Figure 6. Strontium isotope samples from fauna and human tooth enamel from southernmost Scandinavia and adjacent areas. As it can be seen a more "narrow" coalition of troops from East-Danmark (perhaps also Scania, Viken or North Germany) against Jutland is more likely. It also fits more with a seemingly expansion from Zealand across Funen and towards Jutland during this time period (where we find the bog armies). On Zealand in this period you had the fantastically influential and powerful Himlingøje Chiefs (Kings?) at Stevns (and later the Varpelev leaders). They seem to have monopoly on Roman prestige items, probably through Colonia Agrippina (Köln). Thomas Grane has written about it: Zealand and the Roman Empire. (2011) in "The Iron Age on Zealand. Status and Perspectives" (page 101-111) Ed. Linda Boye. Their network can be traced through their symbol - gold snakehead armrings and gold snakehead fingerrings - (maybe Tolkien got the idea for the Ring of Barahir from these ?). So maybe the attackers were orchestrated from Himlingøje - could be a assembled group from many areas answering the call of the Stevns Chief/King. Apparently the elite warriors and the chief/king wore the snakehead finger-rings, whereas only the Chief/King wore the snakehead arm-ring.